Are you following the drama of the costume scandal transpiring at Yale University? I don’t know whether to laugh or cry but something is off on our campuses. Here is the story in a nutshell. Thirteen Yale administrators co-signed a pre-Halloween letter, advising students on how to dress for Halloween so as not to offend their fellow students. The response to Christakis’ email was explosive. Some 750 undergraduates, graduate students, alumni, and faculty signed on to an open letter?telling Christakis that her “offensive” email invalidated the voices of minority students on campus. More than 350 Yale undergraduates, graduate students, and faculty gathered in the Afro-American Cultural Center to attend an open forum on allegations of institutional racism on campus. Over the past few days the furor remains unabated as students have now issued a set of demands, which include censuring the Christakis’ and removing them from their residential positions – essentially ousting them from their home on campus. As a white middle-aged male with plenty of privilege, I hesitate to weigh in on this, but what is going on at Yale and at so many campuses across this country raises serious questions. How does a reflective email by a college professor that challenges the authority of an administration, offers students an alternative way to conceptualize and respond to “transgessive” Halloween costumes, urges students to take responsibility for communicating with each other when offended, and encourages freedom of expression become a major social justice issue requiring punishment for the writers of the offending email and so painful to students that some are claiming “they cannot bear to live in the college anymore” because Yale is no longer a “safe space”. Why do so many intellectually privileged people receiving one of the most exclusive academic experiences in the world feel so alienated and angry? Watching the clip of the encounter between Christakis and the students – some of whom had even been in his classes and knew his liberal views – reveals a troubling fault line. Christakis believed he had an obligation to listen to the views of the students and respect students by engaging them in substantive dialogue. But the students believed he needed to hear their demands for an apology, feel their pain, confess his wrongdoing and ask for forgiveness. By the way, in the face of hateful personal attacks Nicholas Christakis tweeted, “No one, especially no students exercising right to speech, should be judged just on basis of short video clip.” And he invited students who still disagreed with him, and with his wife, to continue the conversation at a brunch to be hosted in their campus home. No one, especially no students exercising right to speech, should be judged just on basis of short video clip. Is the choice really between acknowledging painful feelings and embracing free speech? Where is the line between validating people’s subjective feelings and fiercely confronting ideas one doesn’t like and engaging respectfully with whom one disagrees? I don’t have answers for these questions but it strikes me that the original intent of political correctness was revolutionary and praiseworthy – to include voices not traditionally heard, to widen the academic canon to include more diverse perspectives, and to restrict hate speech aimed at marginalized groups, especially women and minorities. It seems this movement is now producing some absurd results. From legitimate concerns of including excluded voices both from the past and the present out of a sense of justice and a desire to enrich our culture and politics we now silence and exclude out of worry for protecting the psyches and emotional well being of seemingly fragile students. From wanting to engage purposely marginalized ideas in order to deepen our collective search for truth – a process which inevitably challenges, discomforts, and destabilizes – we now need campuses to be “safe spaces” where everyone needs to think twice before speaking, lest they face charges of insensitivity, prejudice, or aggression. Revolutions often eat their own children as well-intentioned principles and causes metastasize?into an ideology that turns on itself. In this case inspiring people who see themselves as victims to behave like bullies, to get people to destroy safe space in the name of creating safe space, and to make some of the most privileged young people on this planet imagine they are not. It is easy for me to think all this is trivial – fragile, entitled, humorless kids – until I ask myself what if someone came to my apartment building dressed up as Hitler. Would I be offended, would I be hurt, would I feel unsafe… maybe. And what would it feel like to live in a residency hall named after a well -known Nazi? Would I be as uncomfortable as those students living in Calhoun College which, honors John C. Calhoun one of slavery’s most fervent advocates? Maybe, at least in the bubble of college campus, we ought to begin to give each other the benefit of the doubt. What would happen if instead of suspecting our fellow student’s and professor’s motivations and believing in the purity of our own, we assumed the best of other’s motivations and were a bit suspect of our own emotional reactions? Imagine if instead of comparing our best to someone else’s worst, we started comparing our worst to someone else’s best. College campus is a place of experimentation. Perhaps it would be worth trying an ancient practice described in the Talmud that took place in the great sage Hillel’s academy. Before Hillel offered his own teaching, interpretation and prescription he always taught the opinions of Shammai, his ideological and philosophical nemesis. 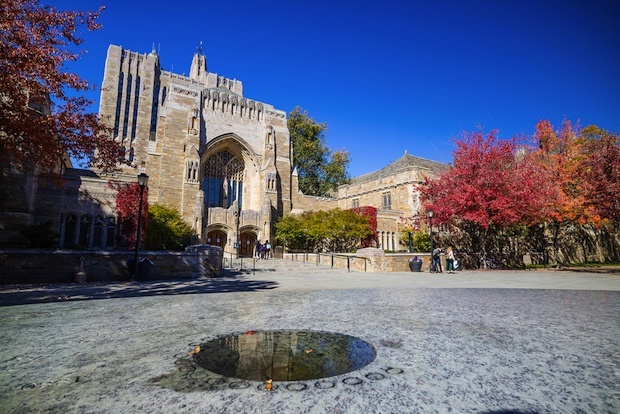 Imagine if over the next week in Yale people actually learned the views of those with whom they deeply disagree well enough to actually teach those views and then came together to debate the issues and the balance between maximizing free speech, creating intellectual space, and insuring a sense of safety for all students. Perhaps in having to crawl into each the other’s views we would even rethink what is worthy of our outrage. After all, just outside the gated privileged world of Yale there is a huge impoverished city. New Haven is one of the poorest cities with one of the greatest income inequality divided along racial lines in this country. I imagine that many of New Haven’s citizens who even have a job, probably serve the Yale community. I wonder how many of them would find this entire turmoil over an offensive costume, whatever side one takes, as ridiculous. Or maybe they would think Halloween really was scary at Yale.